Fuzzy fleece scarves bring comfort on a cold winter day, but for some it’s a comfort denied due to poverty. You don’t even know how to sew to make a warm scarf for others in need this winter. Community groups ranging from Christmas gift programs to homeless shelters will gladly take warm scarves, hats and mittens to help others brave the winter. 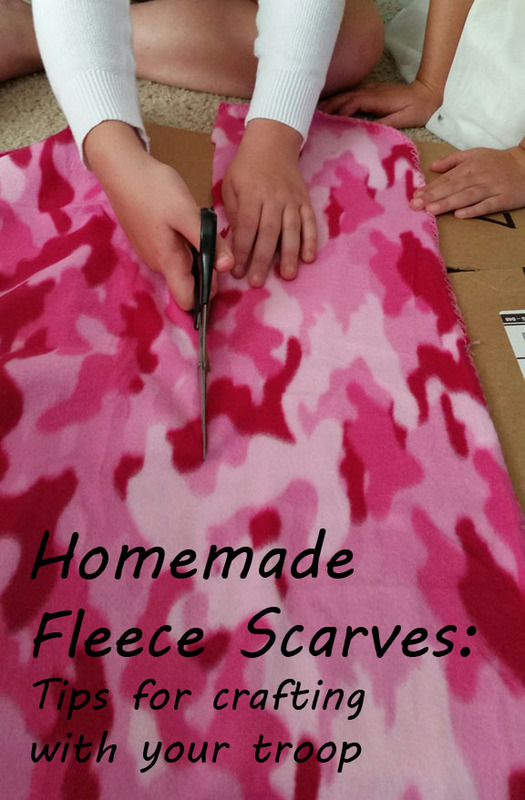 A no-sew homemade fleece scarf is an easy, quick service project for girl scouts of all ages to do. Our Girl Scout troop purchased clearance fleece blankets in the summer for the project, though if you watch local fabric stores for sales, you may be able to purchase fleece inexpensively. You’ll want them to cut the scarves into pieces 12 inches wide by the desired length. 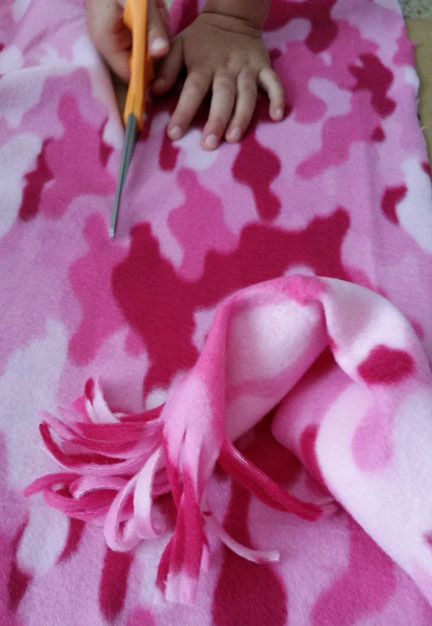 The girls can personalize them by cutting fringe on the ends, tying knots at the ends or even using fleece scraps to tie bows at the end. Hint: Have your girls line up the fabric on a flattened cardboard box and follow the folds in the cardboard for a straighter line! Those Amazon boxes can come in handy! Want to know what to do with all those scraps? Girl Guides of Canada shows what you can do with the leftover fleece. I make simple fleece infinity scarves and sell them in my Etsy shop, but the no-sew version is just as cute! Donating them is a GREAT idea, and this is simple enough to get anyone and everyone involved. Thanks for sharing these ideas! Great idea! I think we will do these in our homeschool in a few weeks when it starts getting cold here, and take them around the homeless people in our town. I love this idea! I’m not great at sewing, and I certainly can’t knit. This is the perfect way to contribute scarves for those who need them. What a great idea! Our church always has a winter drive for the homeless ministry. I’m definitely going to do this with my girls for next winter. This was one of the first big projects I did with my oldest once he mastered scissors – he was so proud to make these and give them away. Hey, that is sew cool! Or should I say no-sew cool? If my daughter was still in scouts….. maybe I can suggest this to our youth leader to make for the homeless. Wow this looks super cute and fun! Perfect for thisi me of the year too. I was a Spark leader for 13 years I love seeing GG stuff! I’ve been out of Guiding for 2.5 years now (had a baby) but can’t wait to get back into it again when she joins sparks in 2 years. This is a great craft for your unit to do and teach them about others. Thanks so much for stopping by the Bloggers Spotlight over the holidays, your pin was added to our group board. Check back next Thursday to see who was featured and link up again. A fun project!! I am featuring this on Crafty Weekends tonight! Thought-provoking blog post ! For what it’s worth if others are interested in a Eagle Scout Service Project Worksheet – Boy Scouts of America , my secretary discovered a template form here “https://goo.gl/VLdQEV“. Disclosure: Use Resources Wisely is a participant in the Amazon Services LLC Associates Program, an affiliate advertising program designed to provide a means for sites to earn advertising fees by advertising and linking to amazon.com. These fees help support the cost of this blog and offset many of our scouting adventures.